As teachers we know how important feedback is to help our students grow and strengthen their skills. Feedback is just as important when you write curriculum. I appreciate it when teachers take the time to tell me what works with my lessons so I will continue to add those elements to my packets. A special shout out to those of you who take the time to leave detailed feedback when you download free or purchased lessons on TPT. Sometimes teachers email me with tips and ideas for my lessons. I keep a list on a bulletin board in my office of all of those tips and ideas that you share with me. I hope to eventually incorporate them into future lessons. 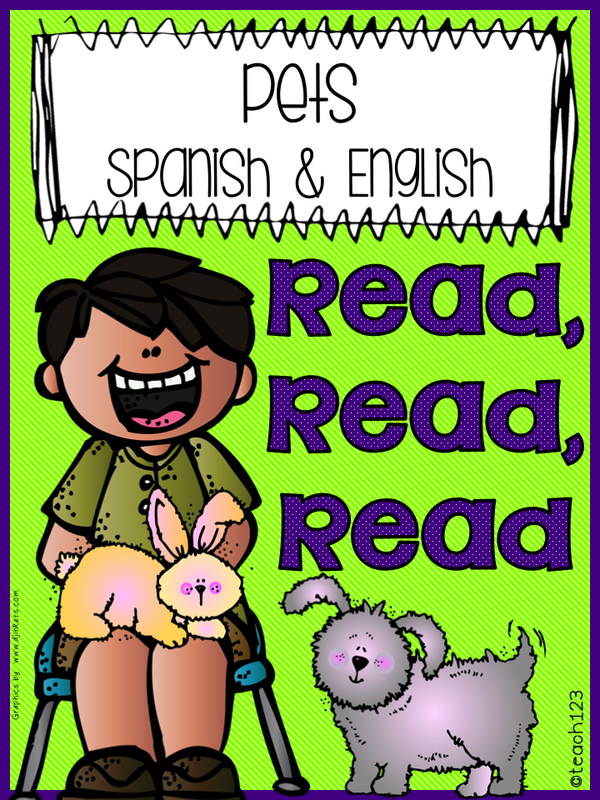 This new series of packets that I am beginning is called “Read, read, read” because your students will have many different opportunities to read the 8 sentences that this packet is based on. I am starting this series because of two different suggestions that I heard from quite a few teachers. 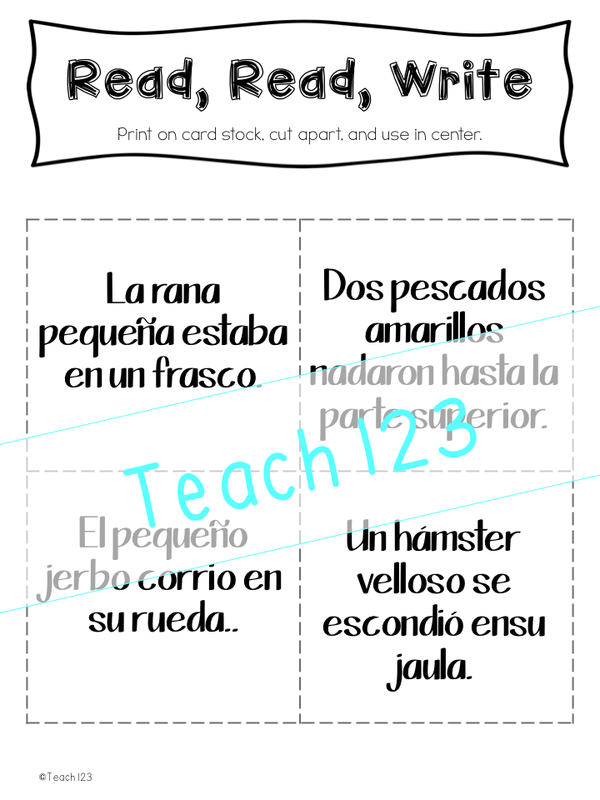 Included in this packet is the English and Spanish version of Sentence Shuffle Center: Pets. 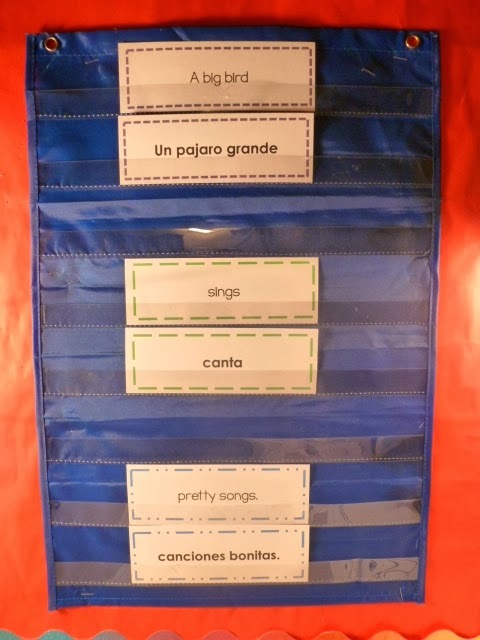 Students sort the cards by color or frame around the words (for black and white version). Then they pick one card from each stack to make a sentence. They arrange the cards to make a sentence. Read it and decide if it is real and nonsense. If they finish early they may shuffle the cards and begin again. 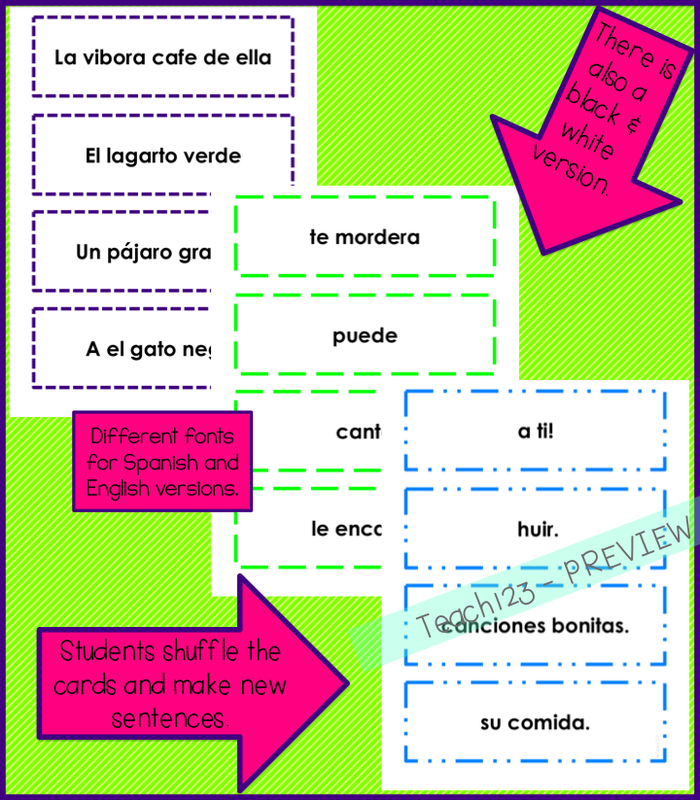 **The Spanish and English cards have different fonts. 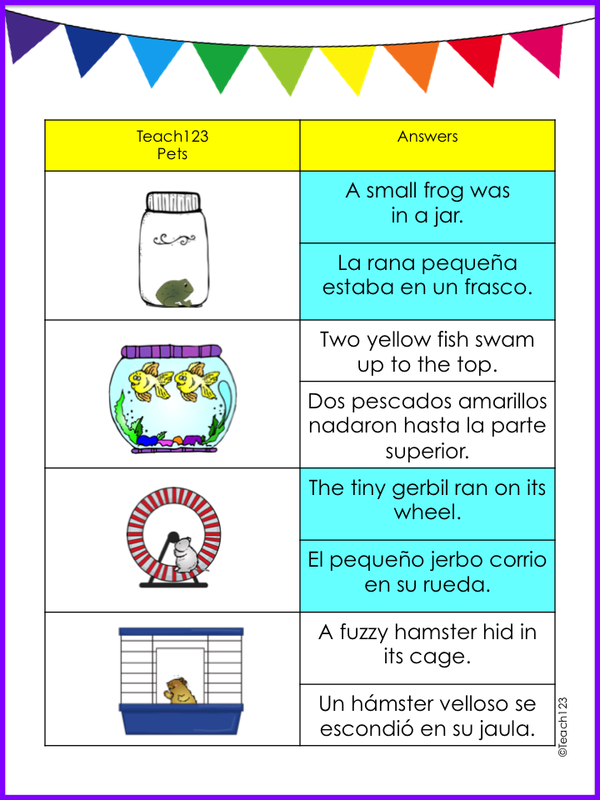 You can also have your students match the English and Spanish sentences. When they finish reading, they will complete a writing assignment. There are 3 different assignments included. The other tip I am beginning with this series is to include visual supports. 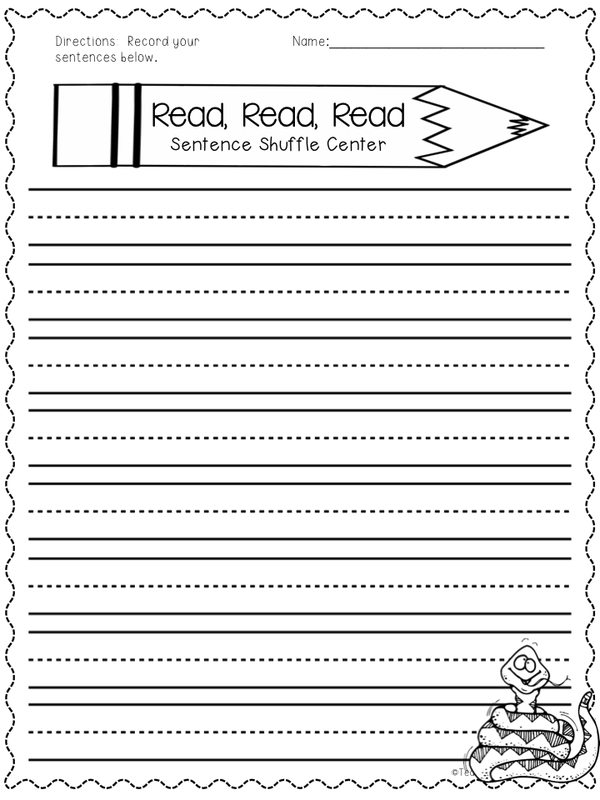 The 8 sentences that are in Sentence Shuffle Center are used in this “Read, Read, Write” center. 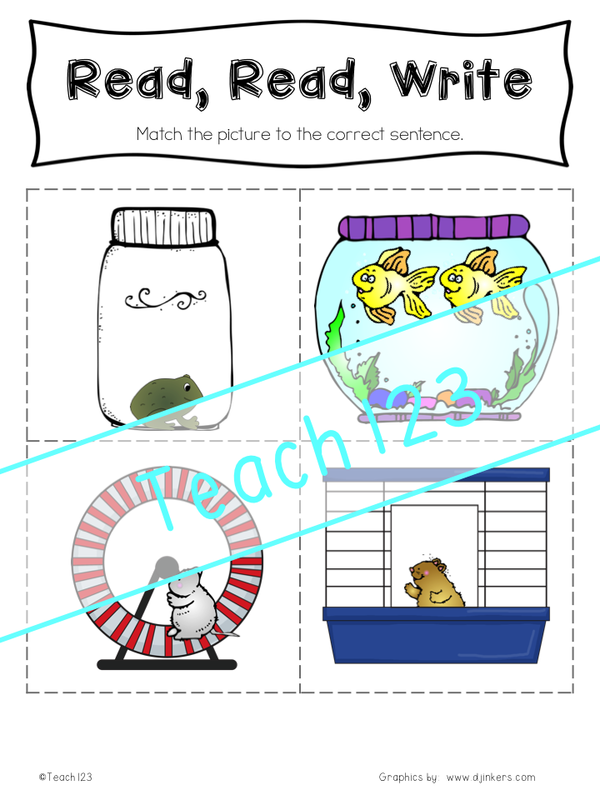 Students will match the sentences to the correct picture. 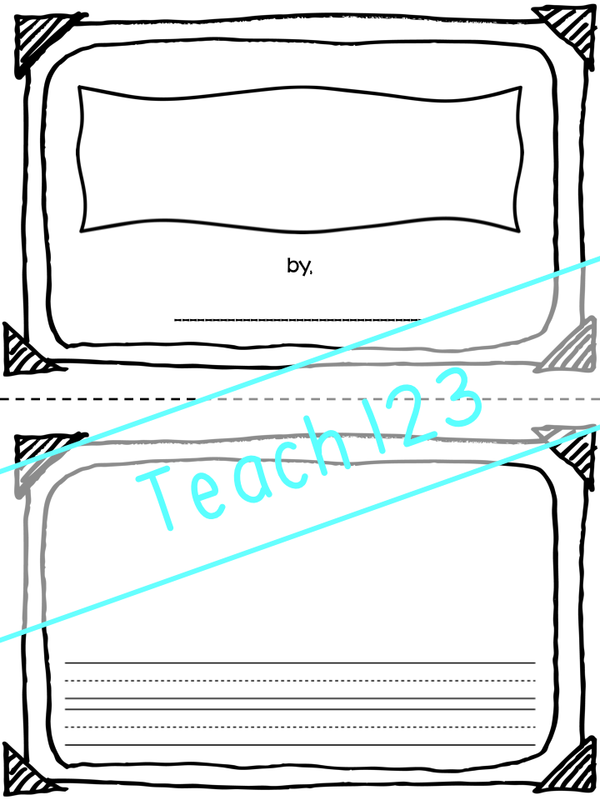 When they finish, they will choose one picture to write either a sentence or story on the paper above. The answers are included. This center is self-checking. 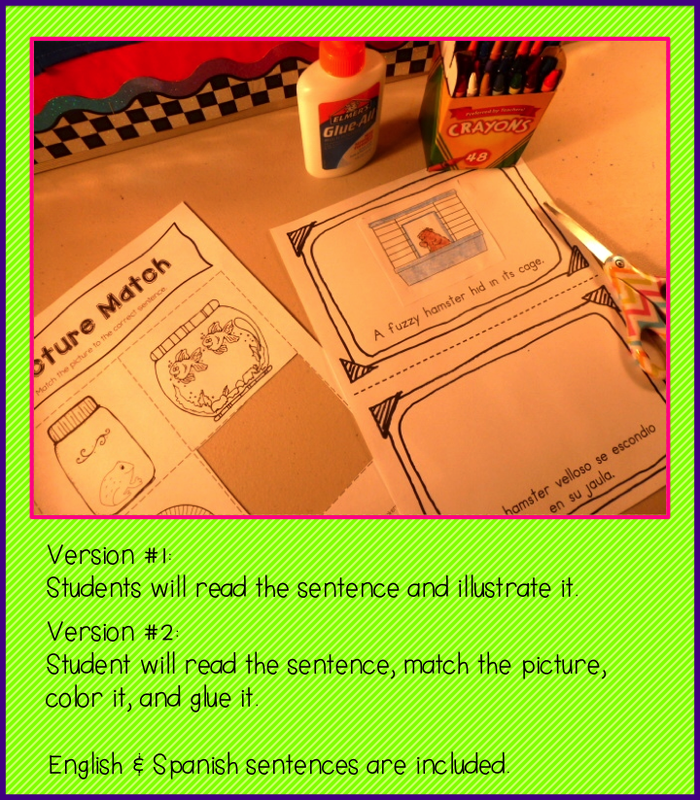 Students will read the 8 sentences in the “Just My Size” book. 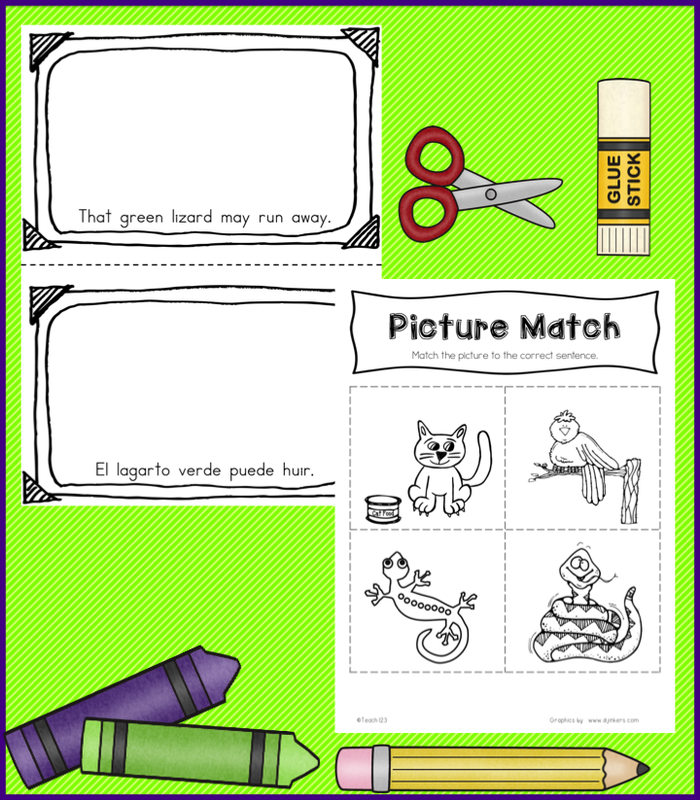 They may either illustrate the book or color, cut, and glue the correct picture from the “Picture Match” page. 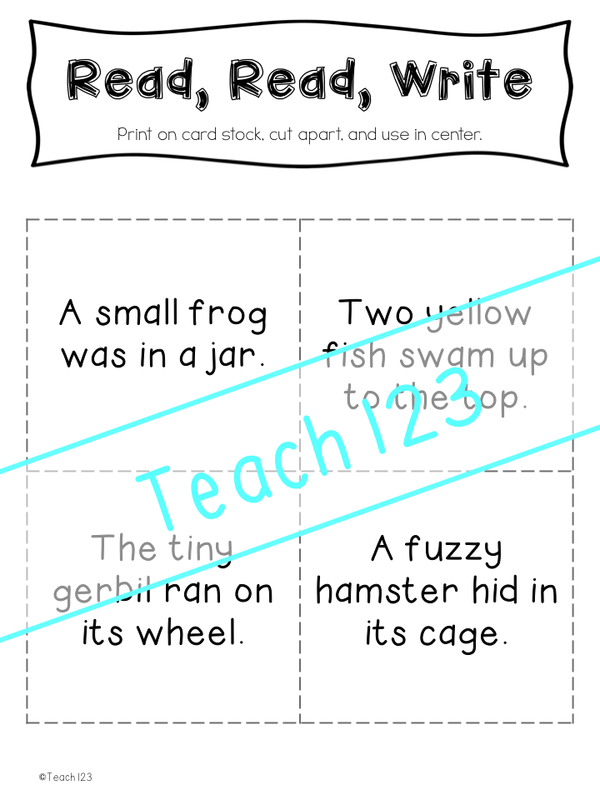 My Sentence Shuffle Centers are sold individually for $4. 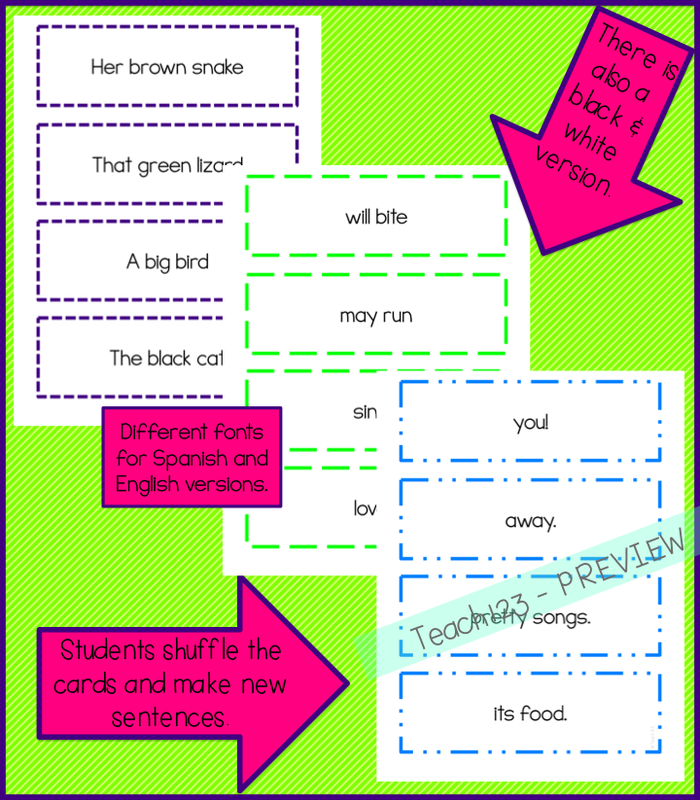 With this packet, you get 2 Sentence Shuffle Centers (Spanish & English) plus Read, Read, Write and Picture Match for $5.95. Have you checked out my A+ E.S.L. Lessons Pinterest board? I don't need bi-lingual activities, but I think it is terrific that you took suggestions from your readers and made these activities. They look terrific!